← March Brown hatch set to blow up next week with warmer temperatures. What flies should you have in your box? McKenzie River Bait Ban Coalition: Would you support a bait ban regulation on the McKenzie River to protect wild trout? TU 678 is participating in a coalition of guides, local businesses and conservation groups are spearheading an effort to get a bait ban for trout on the McKenzie River. This regulation would maintain the current salmon and steelhead bait regulations, while making the entire river artificial flies and lures only for trout. Stopping the WOPR: As anglers who care deeply about the health of our coastal salmon and steelhead, we can’t sit quietly by as the Bureau of Land Management puts local rivers at risk. The Western Oregon Plan Revision (WOPR) is the BLM’s attempt to ramp up logging and dramatically reduce riparian protections on 2.6 million acres of land in the western part of the state managed by that agency. TU Chapter 678 has lead the charge against this plan, as so many of the rivers in our area would be effected, including the Siuslaw, the Umpqua, the Alsea, the Rogue, and the Smith. TU Chapter 678 relies almost entirely on local fundraising efforts. We do not receive operating funds from TU National or the Oregon State Council. We host an annual McKenzie River Two-Fly Tournament (October 10, 2009). 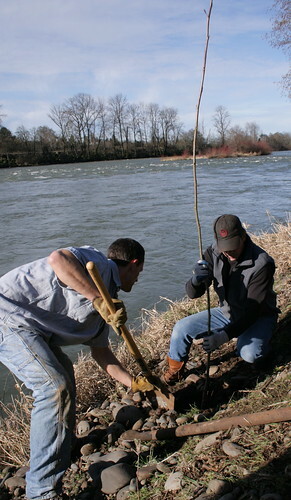 We also host an annual auction, bring fly fishing movie events to the Eugene area, and created an Oregon Bull Trout T-shirt to fund upper watershed bull trout habitat restoration (COMING SOON!). 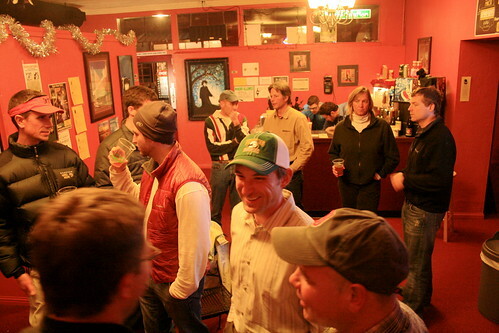 TU Chapter 678 meets the second Wednesday of the month at 7pm at The Caddis Fly Shop, 168 West 6th Ave., Eugene, OR 97401. Each month we host a conservation speaker/leader from the area. Meetings are open to the public. Hope to see you on Wed. for guest speaker Charley Dewberry. We are open to and want do more now that participation is up. Come to the meetings and share your ideas! 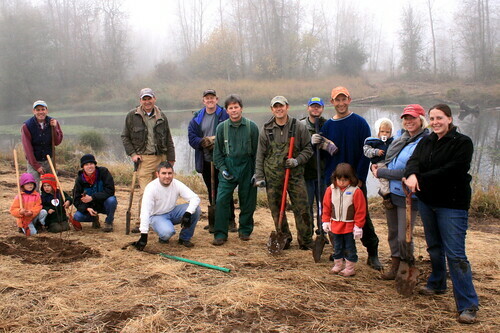 Whose that guy in the green in the middle of the photo from the Whilamut planting? Right. I had Whilamut on the bran.